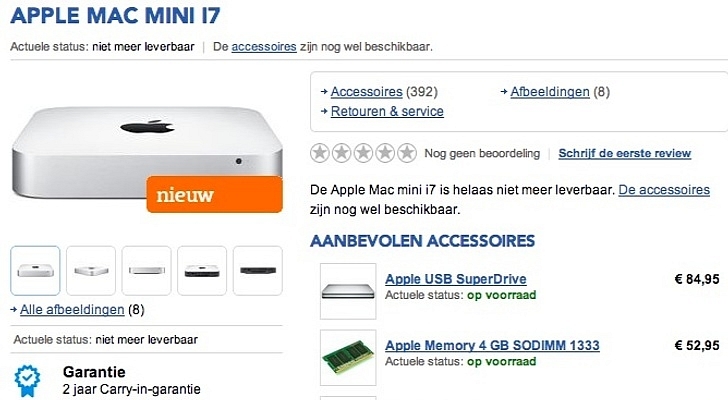 Product placeholders used by Belgian retailer Computerstore.be to designate new Mac mini models indicate that Apple has a refresh planned for its desktop business. Not only that, but the retailer reportedly heard from “reliable sources” that a Mac mini upgrade was indeed in the works, and that the Haswell-based computers were scheduled to arrive in February. The systems will come equipped with Core i5 and Core i7 processors, as well as upgraded wireless capabilities (802.11ac Wi-Fi) and perhaps even a couple of Thunderbolt 2 ports. A machine-translated description certainly seems to indicate that this is the case, excepting the Thunderbolt 2 specification. The Mac mini is one of the least popular Macs in Apple’s desktop lineup, but it’s certainly not something that deserves to be neglected. Many businesses buy these systems in bulk to use them as servers, while others are attracted to the compact form factor and the fact that you can supply your own peripherals and monitor.